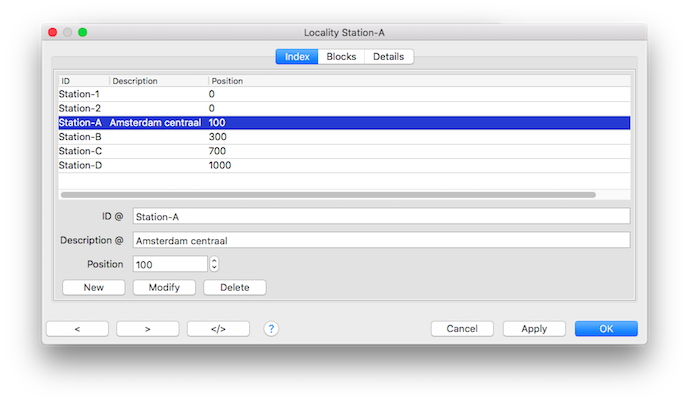 A Location is a group of blocks (or staging blocks) sharing the same logic destination; for example all tracks belonging to one station. Locations may be used within schedules (see Locations and Schedules) or to manage a hidden yard utilizing Flow Management (see below). A list of all defined locations. The unique name of the location. Free text to describe this location. Position in user defined units, like km/hm/miles, for use with Graphic Timetables. Note: The positions are only used if all location positions are set > 0. Overwrites the name, description and KM position of the selected location with the name typed into the name field. Deletes the selected location from the list.